If you’ve ever clicked on an Ad on Youtube or Google, or on a Display Network ad on a website, you’ve contributed to their advertising revenues in some way. Revenues that came in to the tune of $79.4 billion in 2016 (source). The should, and they do. Since 2003 Google has been offering free advertising to non-profit organizations through the Google Ad Grant. In this article I want to provide you with a detailed look at the Google Adwords Grant opportunity, and how your church can use it if you choose to take advantage of it. We'll start very broad, and then address some frequently asked questions we get, finally we'll provide you with a gameplan for how your church can leverage this opportunity. So, what is the Google Ad Grant? The Google Ad Grant is a part of the Google for Non-Profits program. Google makes Google for Non-Profits available to any registered 501c(3) in America (and similar charitable designations in various countries). Once approved and accessed, the Ad Grant provides your organization with up to $10k/mo in in-kind Google Search Network advertising. There are various restrictions or limitations to how Google allows you to use that money on their advertising platform, and the money is a use-it-or-lose-it, in-kind designation (there is no actual money that changes hands), but it definitely gives you the ability to do some free advertising. Where do ads from the Google Ad Grant appear? Believe it or not, when Sergey Brin and Larry Page originally created Google at Stanford University, they were actually hesitant to monetize it with ads. "It could be argued from the consumer point of view that the better the search engine is, the fewer advertisements will be needed for the consumer to find what they want", they wrote in their 1998 paper. Fast forward to today and the space underneath your seach bar is chock-full of advertisements. The number of advertising products has increased through the years, but it all started with those now-familiar text ads on google.com in the year 2000. It's fitting then that the ads that you can make through the Google Ad Grant appear only on google search result pages. You do not get to utilize the grant money for any other placement on the Google Advertising platform. That's right. Through the Ad Grant you are relegated to the original google advertising placement. In the internet marketing world, text ads on the google search results page is a pretty old school ad placement. But don't fret. Like we already mentioned, google search is still a dominant force online, and at CV Outreach we can attest from experience that real people are actively engaging with google search in meaningful ways every day. What are the program policies of the Google Ad Grant? 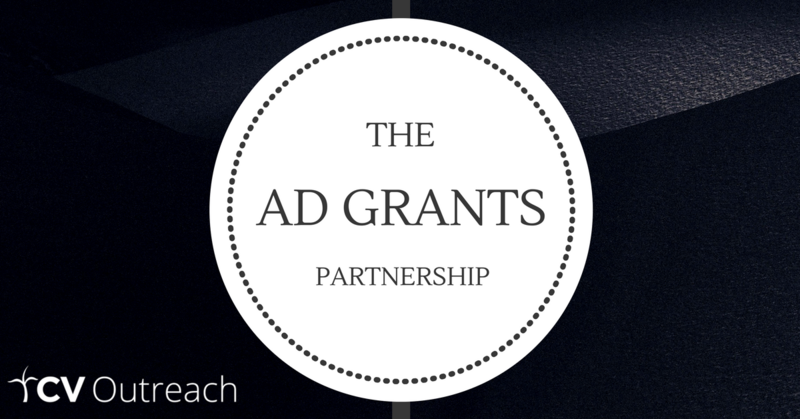 Besides being relegated to the google search results ad placement there are a few other restrictions on the Ad Grant. *Ad Grants accounts must have specific geo-targeting to show ads in locations relevant to your nonprofit. *Ad Grant Accounts must have at least 2 active ad groups per campaign each containing a set of closely related keywords and 2 active text ads. *Ad Grant Accounts must have at least 2 sitelink ad extensions. *Your ads must use conversion tracking with defined conversion values (either in AdWords or imported from a linked Google Analytics account). *Within a month of campaign activation, you must change your bid strategy for each of your campaigns to Maximize conversions. Thanks to the Maximize Conversions feature, your Ad Grant account is no longer hindered by a $2 max CPC. More on this below. First, your maximum cost-per-click bid is capped at $2. That means the keywords that you are bidding on in order to show your ads can’t cost more than $2. For some industries it would be a huge deal. Keywords that have to do with things like insurance, lawyers, or e-commerce, can easily cost $20 - $40 a piece. However, most non-profits are probably not going to be bidding on the industry-minded keywords that tend to be more expensive. In our experience, with a little creativity, churches can comfortably find many applicable keywords that are under $2. A second restriction is that you can only run text ads. You cannot use image ads or video ads. The latest text ad format looks like this. Another restriction is that your ads will appear below the ads of paying advertisers. This is important when you are deciding on which keywords to bid on. Some keywords, even church keywords, can be fairly competitive. If there are other churches that are using a normal, paid Adwords account to bid on those keywords, their ad will appear above yours. Finally, your ads can only run to one domain, and you must own that domain. There is an application for adding a second domain to your Ad Grant, but it's subject to a manual review. *New as of January 1, 2018 is that google wants your website to be "high quality". Google was always taking into account what your website experience was like, but this is the first time they have publicly made this a requirement for Ad Grant eligibility. Here is how they define quality. If you have a terrible website, you have more problems on your hands than just Ad Grant eligibility though. So, make sure your church website is, at least, decent. In the past, you could run your Ad Grant account ads to anyone and everyone. Now, google is asking that Ad Grant recipients zero in on their relevant geographic area. As a part of onboarding to the program they say this "Before your campaign is activated, its geo-targeting will be reviewed for relevance.". So, it's best to run your ads to your actual area of influence. Click Thru Rate is an important metric in measuring the overall quality of an Adwords account. This is a simple way for google to clean up some of the messy Ad Grant accounts that are out there, and force participants to adopt some basic best practices. This new requirement prohibits Ad Grant paricipants from using overly generic keywords, certain branded keywords, and also single keywords. In the past a church could have bid on the keyword "church" or "Jesus". Not anymore. As a part of this new requirement, Ad Grant participants are also prohibited from using any keyword that has a Quality Score below of 2 or less. The Quality Score is a 1 -10 estimate of your ads, keywords, and landing pages. Again, this is a simple best practice, but one that is sort of cleaning house on poorly run Ad Grant accounts. These new requirements shouldn't throw anyone for a loop, because having active Ad Groups, Ads, and Sitelink Extensions is the very bare minimum of running an Adwords Campaign. Google is trying to weed out the number of participants in the program that perhaps set up a super basic account, and never truly utilized the platform in the way that it was intended to be used. These features were previously unavailable through the Ad Grant. So, it's sort of a big deal that Ad Grant participants can use them now. If you have no idea what this means though, it could make using the Ad Grant a little more complex for you. So, what are conversions? A conversion is a specific action that someone takes on your website. By using them, it's easier to monitor the ROI of your campaign performance. You can also assign a dollar value to specific conversions, and in that way track the exact ROAS (Return on Ad Spend) of your campaigns. For churches, a conversion could be as simple as a video view event that you set up in Google Analytics and link to your Adwords account, or a form submission, or similar actions like that. 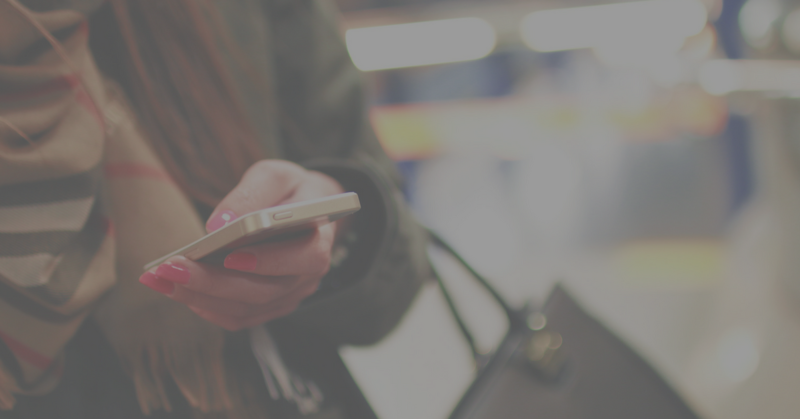 In order to fully utilize conversion tracking, you do NOT have to assing a dollar value. More often than not, churches won't have a very actionable strategy for doing this through the Ad Grant. The Maximize Conversions bidding strategy is a way to build off your conversion tracking, and let google's machine learning direct your Ad Grant dollars to the people that are more likely to result in a conversion. How Long Does the Grant Last? Google Grants was first launched in 2003. As the search network was growing, the company believed that non-profits should be able to use their advertising platform in the same way that for-profit companies were using it. Believe it or not, initially, google staff themselves ran and managed all of the non-profit campaigns. Over time the goal grew to include a desire to open up the free advertising opportunity to as many non-profits as possible. 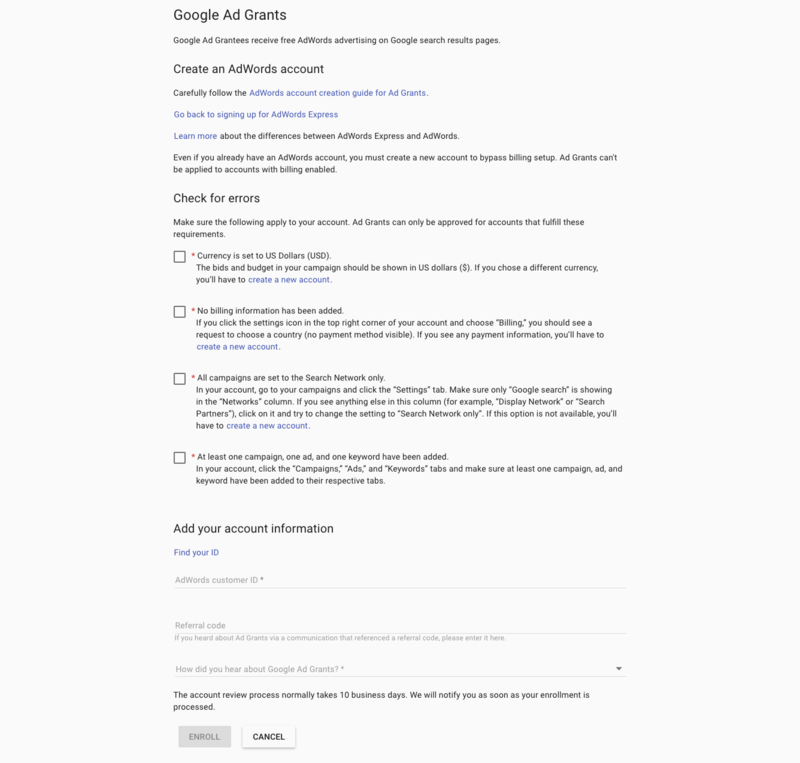 So, today, for organizations that gain access to the Ad Grant, as long as you are compliant with the terms and conditions of the Adwords platform, you can use the Ad Grant indefinitely. To get access to the Ad Grant, you must join Google for Non-Profits, and to do that you have to verify that you are a registered 501c(3). Google has effectively outsourced the verification of 501c(3) status to another organization called TechSoup. So, the first step to join Google for Non-Profits is actually to join Tech Soup. Once you get through the verification steps on Tech Soup, you will be given a verification code. They look something like this 123a4567@1b234c5de6789000. With that code you can start the application process for Google for Non-Profits. Once you are inside Google for Non-Profits you’ll see the other unique products that are available to you through the program. 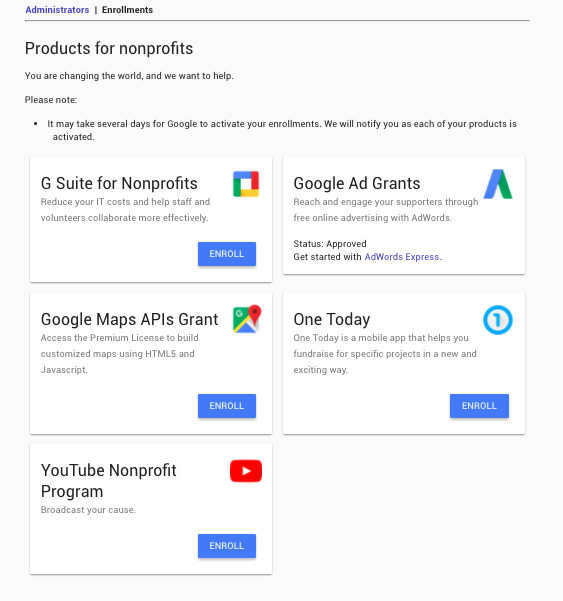 Some, particularly the G Suite for Nonprofits enrollment, might be of interest to you in addition to the Google Ad Grant. As a part of the application for the Ad Grant, you’ll be required to set up an Adwords campaign based on the restrictions we talked about. Note that recently Google has been pushing users towards using Adwords Express during the sign up process. We highly recommend clicking on the link to use Adwords instead. Now that you have access to the Adwords Grant, you may be thinking, "Great! We're going to be spending $10k a month in free advertising, and everyone in town is going to know about us!" I hate to break it to you, but it's not that simple. We run millions of dollars a month in Ad Grant ads for church partners from around the world, and we've noticed a few things common misconceptions about what churches think they will get out of the Ad Grant. First, spending the full $10k each month can be challenging in general. Google has been raising the bar lately on the quality that they expect from Ad Grant campaigns, and many churches struggle to have enough unique content on their website to use for landing pages from their ads. On top of that, finding keywords with enough local search traffic can be challening simply due to a lack of population density for many churches. Keyword traffic is almost directly correlated to population density. For example, even in a city the size of Dallas, "best church in Dallas" is only googled 70 times a month. (we actually recommend a completely different keyword strategy than that type of keyword, but that's a topic for another blog). The Ad Grant can definitely lead to a large increase in website traffic. But traffic does not equal effectiveness. We advise churches to not focus on proxy metrics like website visitors. Instead, we recommend Key Performance Indicators that show truer signs of engagement and ministry effectiveness. So, if your church thinks that the just getting an increase in traffic from the Ad Grant will all of a sudden make your online ministry relevant and effective, chances are you'll be sorely disappointed. Finally, if your church thinks that the Ad Grant will all of sudden bring a surge in people to your weekend service, there is a high chance that you will be underwhelmed. Why? Well, for the two reasons listed above. Plus, promoting a weekend service, is a much more involved strategy than just a lot of free ad spend bringing random people to your website. What is the Ad Grant Good For? After working with hundreds of churches of all sizes on their Ad Grant account strategies, we think that we have found a valuable use for the Ad Grants that are available to all 501c(3) churches. Simply put, the Ad Grant is a good tool for connecting to the people in our world that have questions, need help, or just want someone to talk to. Through the Ad Grant campaigns we have been blown away by how much trust people put in google to help them find the answers to their questions; questions that oftentimes are deeply personal, existential, or involving grave felt needs. We have seen an inordinate amount of people laying bare their marriage struggles to pastors and churches that they have never met. We have seen people reach out in times of crisis or confusion, because our partner churches are simply willing to engage with them. We have seen people with authentic questions about the Bible or Christian beliefs reaching out for insight from our pastors. The call to action from our partner churches is simple. It is the willingness to be available to answer questions and engage with people in their search. If your church is a 501c(3), and is interested in leveraging this unique opportunity, we are glad to partner with you to reach the people who need to be reached on behalf of your church. The partnership is simple. Through CV Outreach, at no cost to your church, we take care of all of the technical details, we run the campaigns, we leverage some unique technical solutions that we have developed specifically for this initiative, and your church gets to respond to the people that come to your website. Whether or not your church chooses to partner with us for the Ad Grant opportunity, know that we are here for you. If you have questions about the Grant, about Adwords, or about how online advertising can lead to genuine connections for your church, feel free to reach out at any time. If you are interested in learning more about the CV Outreach Ad Grants Partnership, click below to sign up to talk with one of our Community Team members. We look forward to partnering together to reach people with the Gospel.